Conspiracy theories are popular and there is no doubt that the internet has fuelled them on. 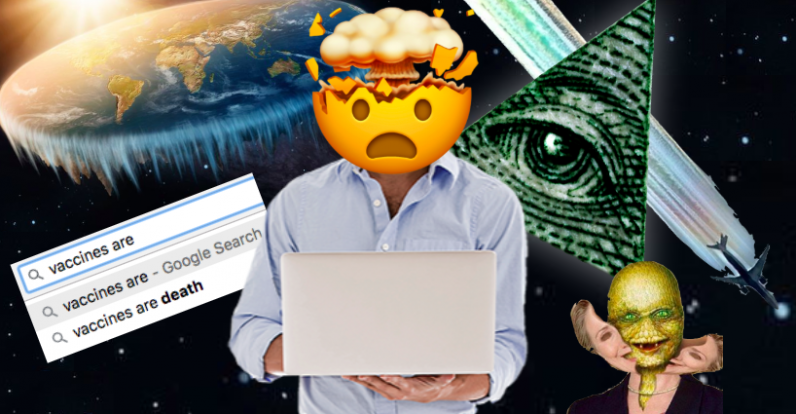 From the theory that 9/11 was an inside job to the idea that reptilian humanoids rule the world, conspiracy theories have found a natural home online. But the extent to which we can actually attribute their popularity to the internet is a question that has concerned scholars for many years. And the answer is not very straightforward. While some argue that conspiracy theories flourish on the internet and social media, there is not yet any evidence that this is true. Conspiracy theories have always been with us. But today the internet fuels them in new ways and enables the deepening of conspiracy theorizing in some online communities. Conspiracy theories feature prominently in current political contexts, but they have a long history. Antisemitic conspiracy theories concerning the supposedly evil and controlling acts of Jewish people date back to antiquity and still exist today. There is even good evidence that conspiracy theories were common in ancient Rome. So we know that conspiracy theories flourished perfectly well without the internet. Contrary to what you might think, there is no evidence that people are more prone to believing in conspiracy theories now than they were prior to the internet. An analysis of published letters to the editor of the New York Times showed that, between 1897 and 2010, apart from a couple of peaks during the global depression in the late 1800s, and the fear of communism during the 1950s, conspiracy theorizing had not increased. People appear to have always found conspiracy theories interesting and worth entertaining. But there is strong evidence that some people adopt conspiracy theories more than others and that belief in conspiracy theories seems particularly strong among people with unsatisfied psychological needs. All people need to feel that they know the truth. They also need to feel safe and secure. And people need to feel good about themselves and the groups they belong to. For people who don’t have these needs met, conspiracy theories become particularly appealing. It is for these people – who may be more inclined toward conspiracy theorizing in the first place – that we see the greatest impact of the internet. Conspiracy theories do not bounce indiscriminately from person to person over the internet. Not everyone reads them, and they are certainly not adopted and shared by everyone. Instead, conspiracy theories tend to be shared within communities that already agree with them. For example, a person who strongly believes that 9/11 was an inside job is likely to join an internet group and communicate with others who also think the same. A person who does not already believe in this conspiracy theory is unlikely to join such a group, or share its material. So, rather than increasing belief in conspiracy theories generally, the internet plays a crucial role in fostering distinct and polarised online communities among conspiracy believers. Believers share their opinions and “evidence” with other believers but are less willing to share with people who are critical of conspiracy theories. So with the internet, conspiracy groups become more homogeneous and their beliefs become even stronger over time. To illustrate this effect, one study showed that if internet users shared conspiracy-related information, they tended to ignore information that ran contrary to the conspiracy theory. In other words, they filtered out information that was not consistent with their pre-existing views. These people also tended to share the conspiracy-related information with other conspiracy believers rather than non-believers. This style of communication creates echo chambers where information is only consumed and shared if it reinforces what people already think. In closed communication such as this, beliefs in conspiracy theories can become stronger and more separated from the opinions of non-believers. A 2015 study showed that believers in one conspiracy theory are also more likely to share completely new, unrelated, and made-up conspiracy theories. Users who believed more traditional conspiracy theories were likely to share new, clearly false and easily verifiable conspiracy theories, such as the idea that infinite energy had been discovered. The study demonstrated that conspiracy internet users are uncritically distributing and endorsing even deliberately false, extremely implausible material. Why is this dangerous? Well, some conspiracy theories are dangerous. Consider anti-vaccine conspiracy theories proposing that vaccines are harmful and that the harms are covered up by pharmaceutical companies and governments. Even though they are false, these conspiracy theories discourage people from having their children vaccinated. Or, consider conspiracy theories that climate change is a hoax created by climate scientists to secure more research funding. Despite abundant evidence that climate change is not a hoax, these conspiracy theories discourage people from taking action to reduce their carbon footprint. Conspiracy theories can have powerful consequences, but we are still learning about when and how people communicate conspiracy theories and why people adopt them in preference to more conventional explanations. Understanding more about how conspiracy theories move about on the internet and social networks will play a crucial part in developing the best ways to respond to them.